Arrives in The Coin Vault's custom certified presentation box. Total weight 26.73 grams and struck in .999 fine silver. Maximum mintage of only 400,000 coins across all options for this size. 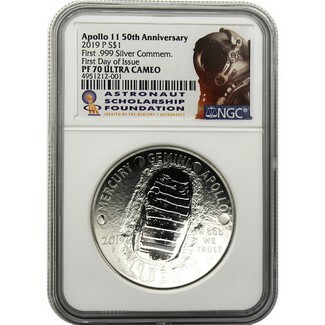 The obverse features “MERCURY,” “GEMINI,” and “APOLLO,” separated by phases of the Moon, and a footprint on the lunar surface. The reverse features a close-up of the famous “Buzz Aldrin on the Moon” photograph taken July 20, 1969, that shows just the visor and part of the helmet of Aldrin. The reflection in Aldrin’s helmet includes Neil Armstrong, the United States flag, and the lunar lander.